If you love fresh herbs in your cooking, now is the time to plan a herb garden filled with deliciously fragrant, scented and colourful plants, which will add flavour to your menu. The dormant period of winter is the perfect time to prepare the ground, order seeds and get out your tape measure and notebook out. Now’s the moment to decide how much space you have to devote to a herb garden – even if it’s just on a balcony – where it needs to be situated and what plants are needed. “Try to select a combination of woody herbs with seed-raised ones – have a rosemary, which you’ll use regularly [when] roasting lamb or chicken, curly parsley and chives. They can go into a container together and just replant them once every two years,” Evans suggests. Other combinations might include a selection of thymes, which are low-growing, and sages, which are quite high, he suggests. Choose colour contrasts, pairing lemon thymes with common thymes and purple sage. Herbs which can easily be grown from seed include: Sweet basil, salad rocket, dill, coriander, chives, fennel, lovage, chervil and caraway. There are others which you may have to buy as plants, including: Lemon balm, curry plant, mint, rosemary, sage, bay and French tarragon. The best compost for growing herbs in containers is John Innes No. 3, says Evans. “It’s got soil and loam in it, which doesn’t dry out as quickly as peat-based compost,” – particularly in spring and summer he notes. 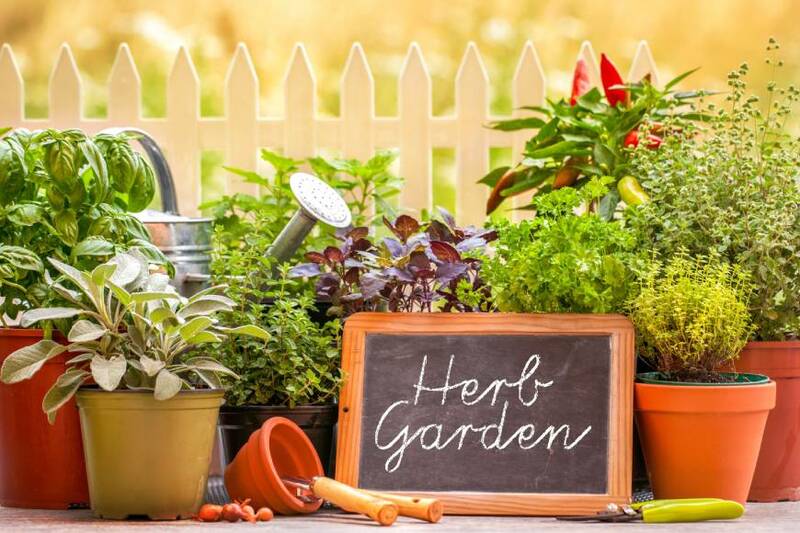 As many herbs enjoy hot, dry conditions and well-drained fertile soil, your herb garden is best off in a sunny south-facing position, with added protection from north and east winds. If your soil is heavy, dig in some grit to improve drainage and you should achieve better results. You need to take note of the surroundings as any herb garden should blend in with the rest of your plot, and note changes in levels and where shadows fall at different times of the day. Of course, as you will be using herbs in the kitchen, the garden should be as near to the house as possible. Don’t plant your herbs at the end of the garden because you won’t want to traipse all that way just for a sprig of rosemary for your roast lamb. If, however, you can’t plant a herb garden too near your kitchen, make sure there is easy access to it by path or stepping stones, so that the soil is not walked on. For those with limited space, a few herbs in pots on the patio will suffice. But those who have larger gardens might opt for a more elaborate, formal garden in a geometric shape, framed by low hedges or paths. Such formal gardens look particularly impressive from above, so place it where it may be overlooked from an upstairs window. Try creating a cartwheel pattern, with each section planted with a different herb, using bricks to represent the spokes of the wheel. Alternatively, you could just add some herbs to your existing border, but check the height they will reach once fully grown – angelica, for instance, grows up to 2m (6ft), so needs to be placed near the back of the border. Beware of planting invasive plants such as mint and lemon balm straight into the ground. It’s best to leave them in their pots in the ground if you want to keep them contained.